Thanks to Anthony from Area I.T. 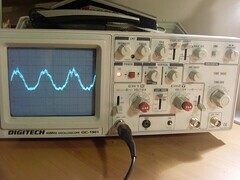 & T, I am now a happy owner of a dual channel 40Mhz oscilloscope. I am happier than a pig in mud! Sorry to leave an off-topic comment, but I have some questions about your arduino ultrasonic rangefinder post from February. I am currently trying to built an ultrasonic anemometer using an arduino and some MaxSonar-UT ultrasonic transducers. I noticed that the schematic pictures associated with this post aren't there anymore and I was hoping you could give me a rough schematic of how you hooked these up. Thanks. Knightmare: I hope you are tracking this page because I can't contact you any other way as your blogger profile is no public. I have fixed up the broken'ness, the schematic should be available now.